This is a salad I crave. The combination of garlic and everything else is just too divine. I used to leave the anchovies out of my caesar, but this recipe converted me. I’ll never eat the filets on top, but in this recipe, they add a perfect accent of salt and flavor. It’s easy and makes more than enough for a few dinner’s worth of salads. Place all ingredients except olive oil, water and cheese into a blender. Blend until nicely pureed. With the motor running, add the olive oil in a slow stream until it is fully incorporated. If the machine stops running, stop and add the warm water and then continue until all the oil is added. I usually add the cheese and stir with a spatula. Wash your romaine lettuce then cut, tear or keep leaves whole, depending on your preference. 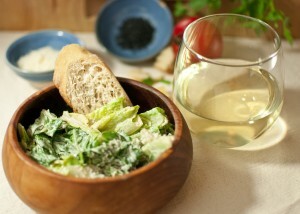 Toss with dressing to taste-I like a lot myself-then serve with croutons and freshly grated Parmesan. Put the rest of the dressing in jar and save for the next salad, all you’ll need is the romaine. It’ll keep in the refrigerator for at least a week, probably two.